Last week, news of a previously-unknown iPhone unlocking device called GrayKey surfaced, and today, MalwareBytes shared photos and additional information about the product, which is designed for law enforcement officials. Created by a company named Grayshift, GrayKey is a small, portable gray box equipped with dual Lightning cables. Two iPhones can be connected to the GrayKey at once, and need to be connected for about two minutes to install proprietary software that's designed to guess the passcode for an iPhone. Once the software is installed, it will work to crack the passcode, a process that can take as little as a few hours for a short passcode or several days for a longer six-digit passcode. Once the GrayKey software has cracked the passcode, it'll be displayed right on the screen of the iPhone. The iPhone can then be plugged back into the GrayKey to download all of the data on the iPhone, including the unencrypted contents of the Keychain, which can then be accessed using a computer. 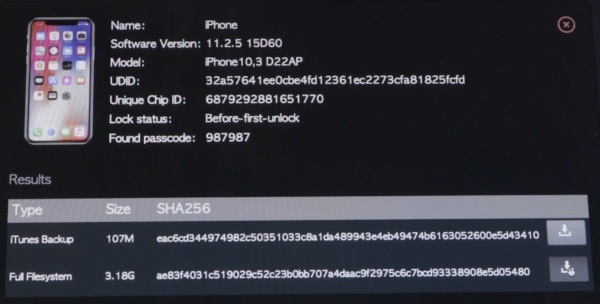 Based on screenshots, the GrayKey can crack modern iPhones running modern versions of iOS. It works with the iPhone X and iOS 11.2.5, the version of iOS that was likely available when the screenshots were captured. It probably also works with iOS 11.2.6, unless Apple has managed to block it in the latest operating system update. Grayshift presumably designed the GrayKey for law enforcement professionals, and it's relatively expensive. A $15,000 option requires internet connectivity and is geofenced to a specific location once set up, while a $30,000 option requires no internet connection and can be used anywhere. MalwareBytes worries that the portable version of the GrayKey could easily fall into the wrong hands. It uses two-factor authentication, but given that people "often write passwords on stickies and put them on their monitors," it's possible the token could be kept in the same location as the device. What happens if the GrayKey becomes commonplace in law enforcement? The cheaper model isn't much of a danger if stolen--unless it's stolen prior to setup--but at 4″x 4″x 2″, the unlimited model could be pocketed fairly easily, along with its token, if stored nearby. Once off-site, it would continue to work. Such a device could fetch a high price on the black market, giving thieves the ability to unlock and resell stolen phones, as well as access to the high-value data on those phones. How the GrayKey works is not known, but it's believed to be using some sort of jailbreaking process that could damage iPhones in some way. It's also not known how the GrayKey device itself is protecting data that's stored on it, and whether or not the data could be remotely accessed by hackers. It's also unknown who Grayshift is selling the devices to. It's possible that sales are limited to law enforcement officials in the United States, but it's also possible that it's being offered abroad. Other devices of this type have slipped out of the hands of law enforcement and have become widely available, so the same could happen with the GrayKey. Apple is continually working to fix the kinds of exploits used by devices like the GrayKey, so it's possible whatever mechanism the box uses will be fixed in a future update. The average iPhone owner likely doesn't need to worry about the GrayKey, but as MalwareBytes points out, it is troublesome knowing such a device could fall into the hands of malicious entities. Ah, yes, the "something to hide" fallacy. Apple, please do what you can to protect us from this. Steve would’ve approved of the design. Does it just come in space grey? Or gold / silver too? $30.000 is peanuts for Apple, they just buy one and before you know it iOS is patched, if not already. This is why you don't use 6-digit passcodes but instead a complex alphanumeric one. Apple: "Hi yes I need to order two GrayKey's." GrayKey: "Okay and where are we shipping these?" As if Apple would try to acquire one that way. ;) They don't even usually buy real estate for Apple Stores directly. The vast majority of people really don't have anything to worry about... for 2 reasons (1) The chances of your phone getting picked up by law enforcement is slim. I disagree with your logic. Misuse of such technology affects everyone. For just one example, let's say the government is doing something evil (unthinkable, I know) and they use this tech to find/silence/discredit a whistleblower. That hurts everyone. This can be very bad, if abused by the gubmint.